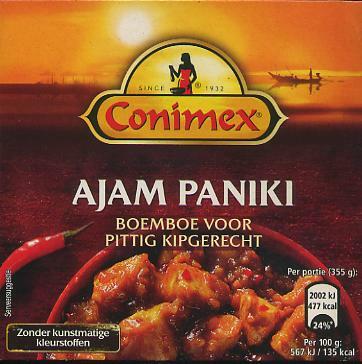 Conimex Tub 07 Ajam Paniki Mix 100g (Sumatran Chicken) - Conimex - The Dutch Shop LLC your store for Dutch groceries. Conimex Tub 07 Ajam Paniki Mix 100g. It has been relabeled for America as Sumatran Chicken.